PWD minister, Tongpang Ozukum, along with his colleague Temjen Imna Along Longkumer and others after the inauguration of Jafu village approach road on February 9. 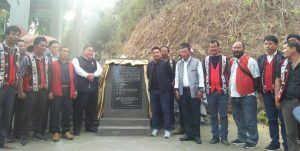 Mokokchung, Feb. 9 (EMN): Minister of PWD (R&B), Tongpang Ozukum, has officially inaugurated the newly constructed tarmac approach road connecting Japu village via Japukong road on February 9. Speaking at the inaugural programme, the minister expressed his sincere gratitude to the minister of higher and technical education, Temjen Imna Along Longkumer, for inviting him to be a part of a grand event. Ozukum also congratulated the convener of the committee and all the villagers of Japu village for their support and hard work extended towards materialising the project into reality. He further congratulated the villagers of Japu village and people of 30 Alongtaki assembly constituency for electing a visionary leader like Temjen Imna Along Longkumer to serve not only his constituency people but Nagas and India as a whole. He has congratulated Imna Along for his valuable contributions towards the people despite being a first timer and young politician. “With a leader like him, the PDA government is strengthened to a higher level,” Ozukum asserted. Meanwhile, Imna Along acknowledged the PWD minister for his valuable time and for visiting his native village. He also urged the Jafu villagers to work together more sincerely and contribute towards the society. He also exhorted the people to be slow and steady and to be patient in dealing with matters of importance. The minister also asserted that many positive changes have taken place under Rio’s leadership within the eleven months in power. He hoped that more positive changes would take place in the future.